The Top Tens of 2017 are in. Find your favorite KBCS DJ’s list here. 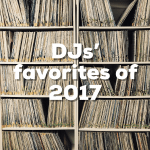 DJ Notes: This is always nearly impossible for those of us who love music so much, but here is a mix that was well represented in the afternoon show this past year. A couple of EP’s that I felt deserved honorable mentions here are: Maggie Rogers Now That The Light is Fading; Chastity Brown’s Silhouette of Sirens; and Whitney Monge’s Stone. DJ Notes: Honorable Mention: Sallie Ford, Naomi Wachira, Rhiannon Giddens, Andrew Joslyn, Robert Plant, Jeff Tweedy, The Shins, Dan Auerbach, Jason Isbell, Old Crow Medicine Show, Brian Blade, Meklit Hadero, Boubacar Traore, Aimee Mann, Maggie Rogers, Jaco Pastorius, Mavis Staples, Sharon Jones, Curtis Harding, Moses Sumney. DJ Notes: Again the year comes ’round for a TOP TEN! And as usual I must emphasize,there have been so many choice creations throughout the year, this list is a mere trifle of what has been created in 2017. Please enjoy these as you explore more music into 2018. Thank you for support of community radio KBCS 91.3FM and the show Variations. Cathy Fink & Marcy Marxer Get Up And Do Right Community Music Inc. Visible Cloaks Reassemblage Rvng. Intl. DJ Notes: A great year for creative music, if for precious little else. Also worth a listen: 2017 releases from Jo Ganter/Marilyn Crispell, William Parker Quartet, Mary Halvorson, Kate Carr, Syrinx Effect, Mat Maneri, the Necks, Gavin Bryars, Chuck Johnson and Saicobab. DJ Notes: As always, so much music that is worth more than one spin. Tip of the hat to The Walin’ Jennys, Ben Hunter&Joe Seamons with Phil Wiggins and oh my Chris Stapleton. DJ Notes: It’s such a pleasure to program Sunday Folks for you. Thanks for listening. Top 10 lists are ever-changing. On any other day I could have included; Leif Vollebekk ,Colter Wall, Southern Avenue, Lydia Ramsey, Kacy & Clayton, Wailin’ Jennys, Stanton Moore, Holly Macve, Tim Grimm or Chicano Batman. Go explore. DJ Notes: !Viva la Raza! !Viva Mexico! DJ Notes: 2017 was another great year for bluegrass music! Steve Earle & The Dukes So You Wannabe An Outlaw Warner Bros.
Ivan Lins América, Brasil DGE Entertainment ltda. DJ Notes: These are not in any particular order and represent just a small portion of a bumper crop of bluegrass releases this past year. DJ Notes: This list is in no particular order. I also really liked releases from Eilen Jewell, Laura Cortese and the Calling Cards, Oumou Sangare, St Vincent, Emel Mathlouthi, Tori Amos, Courtney Barnett & Kurt Vile, Shannon McNally, Shelby Earl & Allison Moorer and Lilly Hiatt. Thanks for listening, it’s my pleasure to share music with you on KBCS.